I HAVE USED AN IOMEGA USB-powered 500 GB hard drive for nearly a year and can strongly recommend this pocket-friendly device (at left). My only problem with the drive is that it's so easy to use that I've dumped junk onto it. I don't have enough portable storage. My unhealthy data hygiene means I'm gathering more than 70 GB of digital data every month and that it's getting more complicated managing my data stores. I've used the Mozy Home service bundled with the drive and also increased my Dropbox account to 50 GB but at the end of every semester, I need to archive student work along with my own content in a more findable way. I'm talking to John Jennings, Tipperary Institute's content management specialist, about procedures I can follow to improve my work flow around the consumption, creation and curation of digital archives. 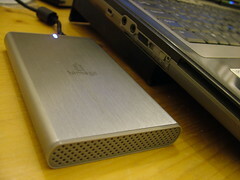 But at the moment, I need another USB-powered hard drive to push me through the first part of the 2010/11 academic term. Hopefully, some visitors might leave behind some comments that alert me to better ways of managing my data store. Still a burning issue: "Tech needed in my sitting room" from January 2009. Previously: "Doubling Storage Requirements" on my Inside View Blog, April 28, 2009. 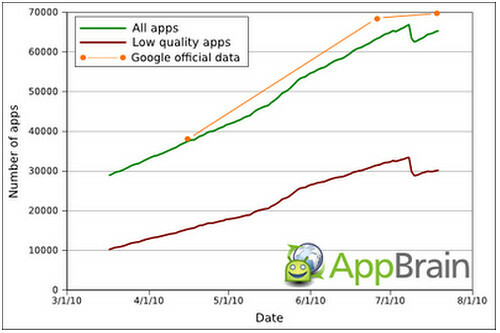 IT'S GOOD TO SEE GOOGLE pulling the plug on trash apps (see AppBrain chart above). While some readers may argue that it's better to cull at source, I'd rather watch an open Android market bubble up unfettered diversity and trust the wisdom in the crowds to guide my selection of Android applications. AppBrain has been very helpful in this regard--in fact, if I can't find an app positively reviewed by the AppBrain, I won't install it. ALTHOUGH SOME PEOPLE may be getting browned off about the game play of Foursquare, I've a lot of time for location-based services. 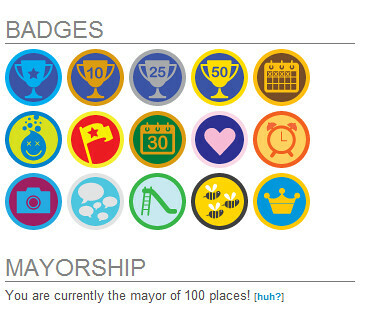 During the past year, I've slowly climbed up and slipped down from holding 100 mayorships--but anyone who's played Foursquare knows how to game the system and check into places to claim top dog. In fact, the more time I spend rewinding the history of avid Foursquare users, the more often I find places that aren't on anybody's map. But that's not important--it's just a game filled with inexpensive badges. I can't compete with the badge brigade. Guys like Niall Fagan (35 badges) and Vincent McCool (22 badges) consistently top the Irish Leaderboard for their check-ins and if you look at their histories, they plan their journeys to collect badges awarded for multiple stops over a 30 day period. When Foursquare gives away a badge for checking into a gym at least 10 times in a month or for visiting four or more Starbucks, some people are going to try to do those things, just to earn the badges. And when Foursquare gives me reduced prices on bagels and coffee (as it has when I've walked from Penn Station to Central Park), I'm all for using the service. EVERY SUMMER, SOMETHING STUPID happens to my mobile phone data usage pattern. This summer it could be my stupidity, a rogue Android application or something strange about the way O2-Ireland passes my phone off from EDGE to 3G and back while I'm commuting to work. I can't tell what's happening but I know that Google Listen downloaded Leo Laporte's This Week in Google Episode 52 last Thursday while I was en route to Tipperary Institute and by the time I parked the car next to my office, I'd racked up more than 41 euro of data charges. That's more money than I pump into the car for a week's commuting. I shouldn't be paying data charges to O2 because I'm subscribed generous data plan so I'm investigating what's happening. In the meantime, I'm reviewing my APN settings and switching back to using a SonyEricsson Satio and a Nokia N86 for some of the best megapixel shots that you can get from mobile phones of the Irish countryside. 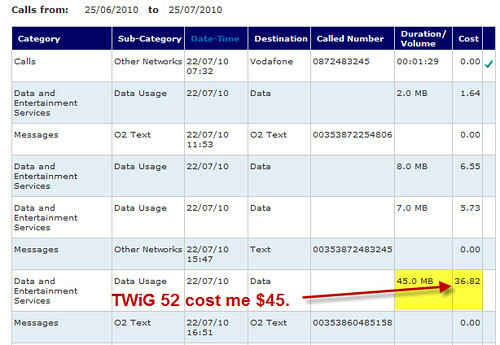 Check back in a fortnight if you want to see what my monthly mobile phone bill is. I like O2-Ireland's service and will buy a rugby shirt with the O2 logo if I get some comfort in regard to my mobile data usage. More: TWiG Cost Me a Bomboo. I'M HAPPY WITH THE ANDROID applications I'm running on my Xperia X10 and thought it might be worth the time it takes to list them all in one spot. I tend to move apps around, deleting some and even reinstalling them when I remember what I've missed. I haven't actually used all the applications shown below the break, so this listing should be considered a mere phase point. I've discovered that fellow Android users like comparing notes by sharing views of the application screen. 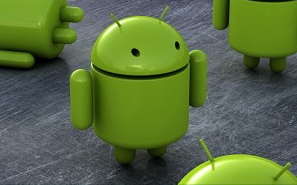 So I'm listing Android applications here in the hopes that other Android owners stop by and share their ideas too. All these apps were free to download and they're free to use, although I've freemium services on Evernote, Groovshark and Dropbox. I consider several of my apps to be essential. They are Dropbox, Evernote, Flightstats, Foursquare, Google Sky Map, Google Talk, Google Talk, GPS Status, Grooveshark, Guardian Anywhere, Keep Wifi, Layar, Listen, mAnalytics, Maps, My Tracks, Newsrob, Opera Mini, PDF Viewer, Phone Recorder, Qik, Seesmic, Shazam, SMS Backup, Swype, Track ID, Tricorder, TripIt, Tweetcaster, and YouTube. My complete listing is after the break. NEW CODE FROM FACEBOOK provides all pages on the internet with the same tools that all Facebook Pages have. If Pat Phelan had a “like” button to his article on Foursquare check-ins, he would have been able to send a follow-up news feed story to all Facebook users who liked his discussion of growing bored with checking into venues. This goes beyond just carrying a conversation from a blog to Facebook. With "like" buttons as the plumbing, any object that you "like" will be able to communicate with you directly through Facebook's news feed. In other words, all likeable webpages become more than linkable--they gain two-way communication power. WITH SUMMER BRINGING its normal run of silly news items, I selected a few topics from five papers that illustrate how Ireland is handling its gradual descent into a debt-ridden society. Billions of euro have been pumped into failed banks, leveraging at least two generations with government debt. The wind noise on my YouTube clip comes from the breeze blowing around Hore Abbey as I flipped through the Sunday papers. Direct link to video and http://www.insideview.ie/files/hore-abbey-news.mp3. One Week Ago: "Quick Sunday News", 18 July 2010. One Year Ago: "Serviced offices in Ireland", July 25, 2009. Five Years Ago: "Since moving to Europe" on Irisheyes, 26 July 2005. ALTHOUGH MOST AMERICANS who lament their use of their iPhones while roaming overseas have caused their own headaches, I think it's important to outline how it's possible for your iPhone to stick you with several hundreds of dollars of roaming charges even though you've switched off data roaming while overseas. 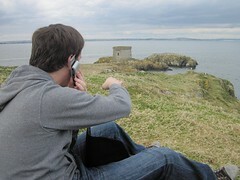 I've made my observations while chatting with visitors to Peggy O'Neill's B&B and after hearing some reception staff tell stories about iPhone users connecting to their hotel wifi. The problem often starts when your American iPhone detects an unsecured, but not free WiFi hotspot. You're prompted to open Safari and then your browser takes you to the WiFi hotspot's login page. While you're logging in, the iPhone seems to think you're connected to WiFi (the service you want) but the poor phone cannot connect to the internet via wifi. So without asking, the iPhone reverts to 3G over-the-air pricey data roaming. I don't see that kind of behaviour on my Nokia handsets because I've set the data connection to "always ask" and they pop up nag screen every time I try to use a different data service. My advice to those traveling to Europe with an American handset: change the phones APN address--just add your initials to the end of the APN. Do that and it doesn't matter what you forget to switch off. Plus, you don't need to depend on your operating system picking up on whether you've changed data services. Then when you get home, just revert to the proper APN by removing your initials. But if proper 3G data services are essential, get yourself a Maxroam SIM and know you'll be able to connect to wifi or 3G no matter where you're visiting in Europe. 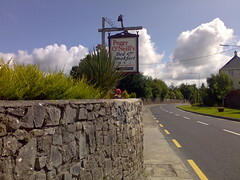 Photo of Peggy O'Neill's B&B down the street, comfort sleeping for all nationalities. I USED A BIG TABLE aboard Citygold service on Irish Rail to reduce an hour of a Deep Dive into Audioboo into a short six-minute session and then uploaded it via free wifi. In the clip (play it above or below), Mark Rock talks about both the origins and evolution of the social audio service, Peter Donegan talks about brooding hens, and I offer some segues to introduce questions from the audience. The Deep Dive sessions (workshops) were better value than the speaker sessions at the dotconf. The 90-minute beer and cake networking after the day's proceedings was exceptional. Bernie Goldbach's curated audio links. WE'RE TAKING IRISH VOICES into a Deep Dive session at #dotconf in the National College of Ireland today and have included Anthony McGuinness (at left) as cover art for the session. The eight-minute audio snippet that runs from the embedded Audioboo player below is a quick cross-section of audio created and shared by different voices across Ireland. Audioboo is a simple and elegant first step into social audio for those who wish to leverage high-quality sound in local environments. Several people are using Audioboo for interesting things, including local reports from meetings, eureka moments, audio diaries and third level assessments. In Tipperary Institute, Audioboo has enabled me to increase the sophistication and frequency of student work. I'm looking forward to learning how others share their audio during an afternoon session in the dotconf. If you want to hear voices from the venue, you should check out the dotconf tag in Audioboo.